Trigger finger is a condition related to the movement of the tendons as we bend the fingers towards the palm of our hand. This movement is called flexion of the finger. First of all, we need to understand a little bit of anatomy. The tendons that move the fingers are held on to the bones by a series of ligaments called pulleys. This ligaments form an arch on the surface of the bone, creating a sort of a tunnel where the tendons pass and run when we flex our fingers. To keep the tendons moving smoothly under the ligaments, the tendons are wrapped under slippery coating called tenosynovium, thus reducing the friction between the ligaments and the tendon. 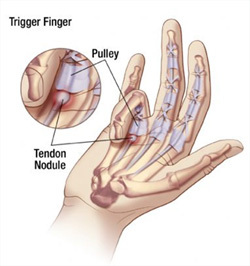 In the trigger finger, the tendon is inflamed and thick, creating a nodule. The ligament can also thicken. Trigger finger may occur in one or more fingers at the same time or may occur in different fingers at different times. Physical therapy is normally advised, being able to treat, in most of the cases, the trigger finger. When physical therapy doesn’t resolve the trigger finger, surgery can be performed. However, even if surgical procedure is undertaken, physical therapy after surgery is also needed to reestablish the movement of the finger, reduce the pain, stretch and strength the tendons, and to work on your hand grip and finger pinching skills. The symptoms of the trigger finger include pain and a clicking sensation when the finger is bent. Pain occurs when there is an attempt to bend or straighten the finger. Tenderness is often present in the area of the nodule. This clicking sensation occurs when the nodule moves through the tunnel formed by the pulley ligaments. When the finger is flexed, the nodule passes under the ligament, causing the clicking sensation, meaning that the nodule got stuck under the tunnel. The nodule cannot move back through the tunnel and the finger in locked in the flexed trigger position, producing inflammation and swelling. This causes a vicious cycle of triggering, inflammation and swelling, and with time can form fibrosis around the affected pulleys. The symptoms are more pronounced in the morning, due to the worsening of the edema and manual inactivity during the night (Kraemer, B.A., Young, V.L., Arfken, C., 1990, cited by Junior, R.M., 2008). Trigger finger is more common in women, particularly in pregnancy, puerperium and menopause, and between the ages 40 to 60. Trigger finger can be caused by various factors, like manual activities, professional, sportive or recreational, that demand forced clench and grasping, or repetitive movements. Some diseases can predispose to the trigger finger like rheumatoid arthritis, diabetics, hypothyroidism, amyloidosis, and some infections (tuberculosis, fungi infection,…) (Junior, (Junior, R.M., 2008). In some cases the trigger finger can also be caused by a congenital defect (present in birth), that forms a nodule in the tendon. This last case is not usually noticed until infants begin to use their hands.